Shred Nations recognizes that our customers are the cornerstone of what makes our business “shred”. Our customers are extremely important to us. 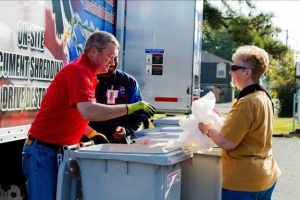 We strive to not only be the most customer-centric organizations in the shredding industry but also in the world. Our team of dedicated professionals strives everyday to give our customers the best experience possible no matter what. On the subject of customer service, we want to provide as much information about shredding to our customers as possible. Check back frequently as we strive to add information on a daily basis. No matter if you are looking for simple information about how the shredding process works or if you are looking for what size shred particles are needed for a specific job, we are here to help. From businesses to residences we can service all of your needs. Click here to access our customer’s most frequently asked questions—it’s a great resource to start your search. If you don’t see the information you are looking for you can give us a call at (800) 747-3365 or contact us via e-mail at support@shrednations.com.